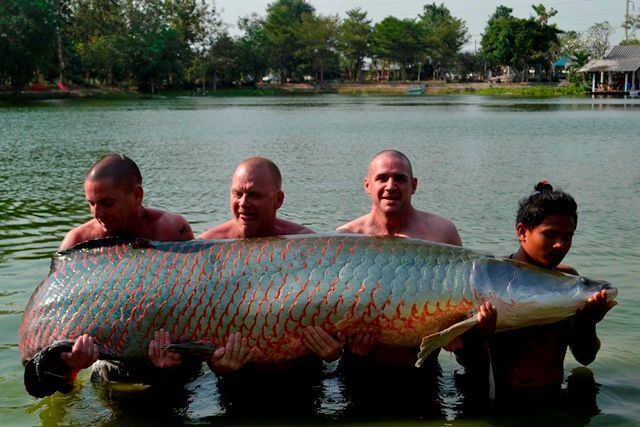 Peter Ryan was back with three of his golfing buddies and what a session he had joining not one but two of the Palm Tree Lagoon BIG fish clubs firstly with a 170lb Siamese carp and then with a 465lb arapaima. 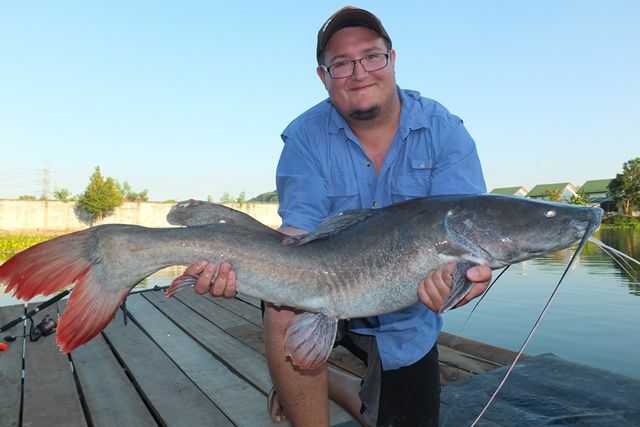 Between them they also had some other great catches like tiger catfish, rohu, Mokong catfish as well as both Amazon and Asian redtails. 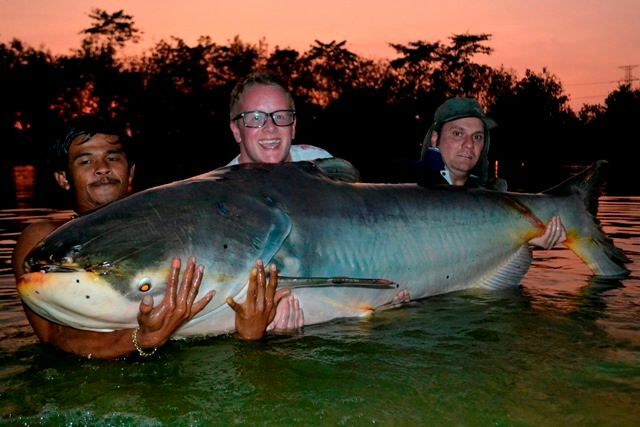 Chris Kennedy was back and in fine fishing form, the pick of his catches probably has to be the almost impossible to catch Thai mahseer but it was given a close run by the biggest firewood catfish ever caught at Palm Tree to date, and by the Palm Tree Lagoon 300lb Catfish Club qualifying Mekong catfish he also caught ... what a session.... 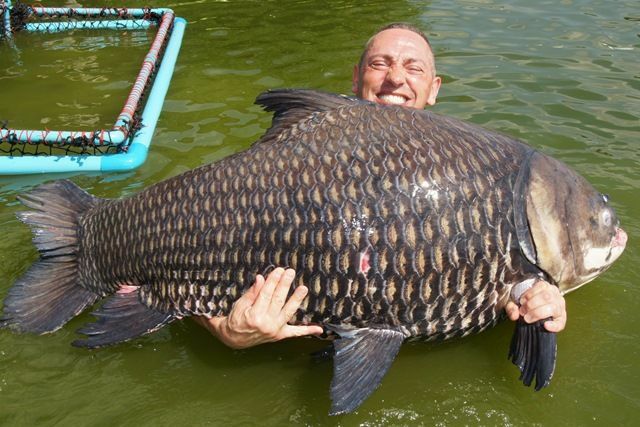 In addition to these he caught a large number of other species such as arapaima, rohu, wallago attu, giant snakehead, striped catfish as well as both Thai and Amazon redtails. Peter Morris and his son William Peter Morris also visited Palm Tree for the first time during the month. 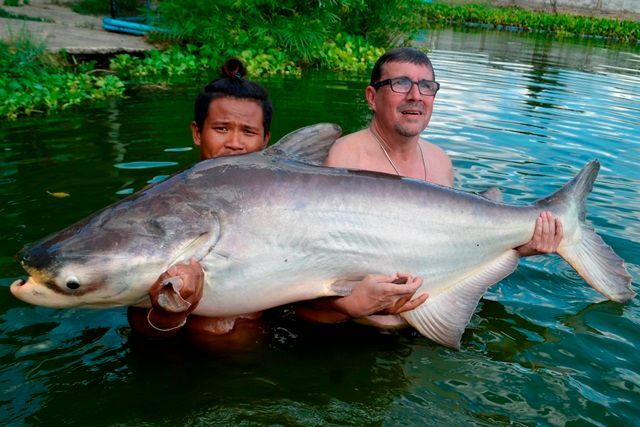 They both had impressive catches Peter with a stunning Atlantic tarpon and William joining the Palm Tree Lagoon 300lb Catfish Club with a more than awesome Mekong catfish. They also caught striped catfish and Amazon redtails. 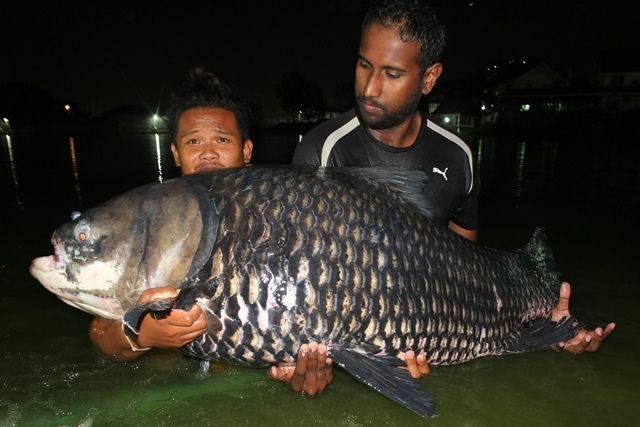 Aaron Arokiaraj returned this time accompanied by Laikien Daggett and between them they landed some awesome catches. topped by gaining membership to the Palm Tree Lagoon 150lb Carp Club with a stunning fish that Aaron battled to well after dark. 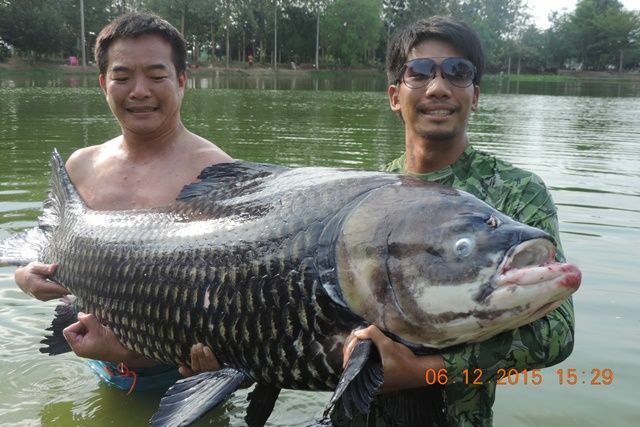 In addition they caught many other stunning fish such as Mekong catfish, arapaima, big-Y catfish, pacu, tambaqui, striped catfish as well as both Amazon and Asian redtails. 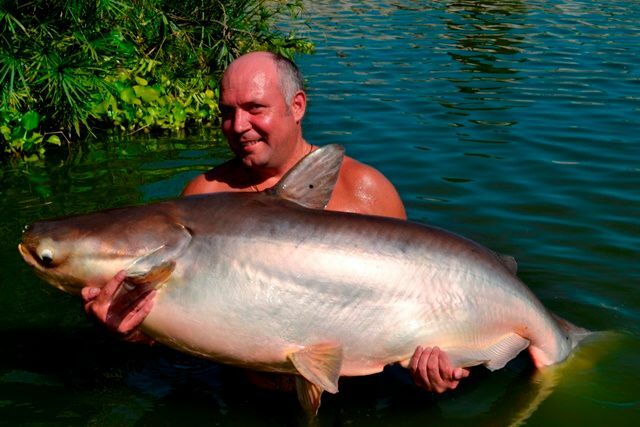 Paul Clapham was back a month after his previous visit and this time he not only caught a 120lb Siamese carp which was his target fish he also gained membership to the ever expanding PTL 300lb Catfish Club with a monstrous Mekong catfish. Anthony Norton returned with his fishing mate Tom Codling. 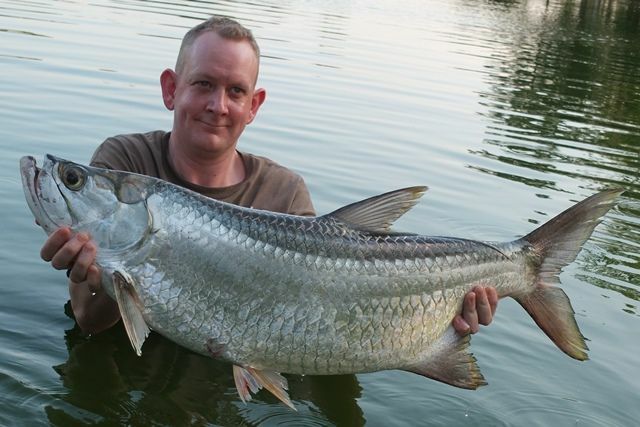 Anthony caught an awesome Atlantic tarpon where as Tom's best fish was a Siamese carp weighing in at 120lb+. 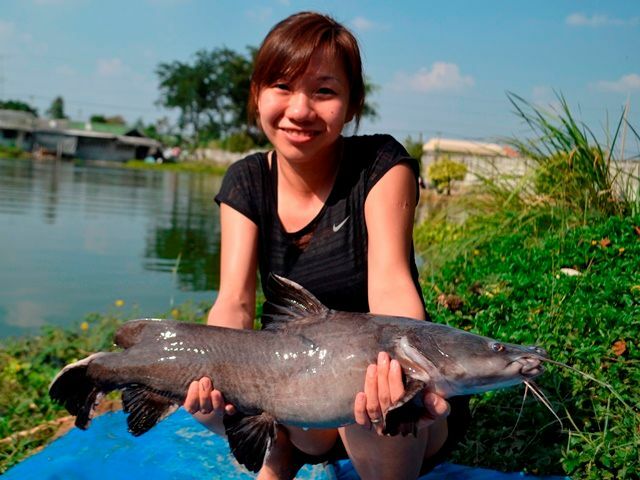 They also caught some good sized Mekong catfish as well as tiger catfish and Amazon redtails. 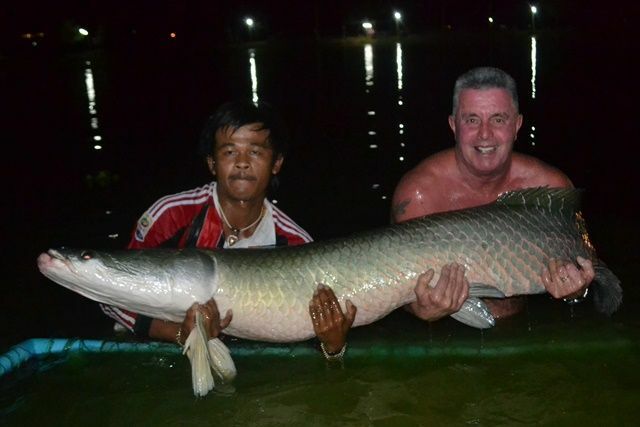 Terry Eustace and his nephew Andrew visited Khao Laem Dam during the month on a quest to beat Terry's pb rohu. 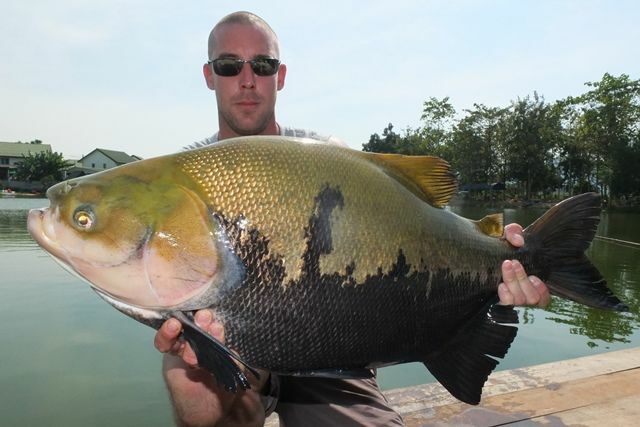 Unfortunately due to low water levels in the dam this year the rohu hadn't come in from the depths. 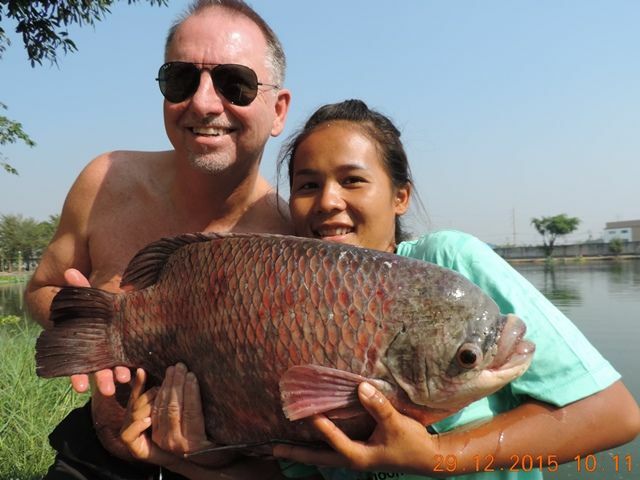 However, Terry and Andrew did catch some stunning other species that included black shark minnow, java barb and yellow catfish and visited the For Rest resort on the river Kwai Noi and the Bridge over the river Kwai Yai on the way back to Palm Tree. Palm Tree regular John Wilson was back and as usual was all smiles even getting out the Christmas hats for a couple of the photos; he caught some great catches that included his first vundu catfish in Thailand, wallago attu, rohu, Siamese carp, Mekong catfish, big-Y catfish, black shark minnow and Amazon redtail. 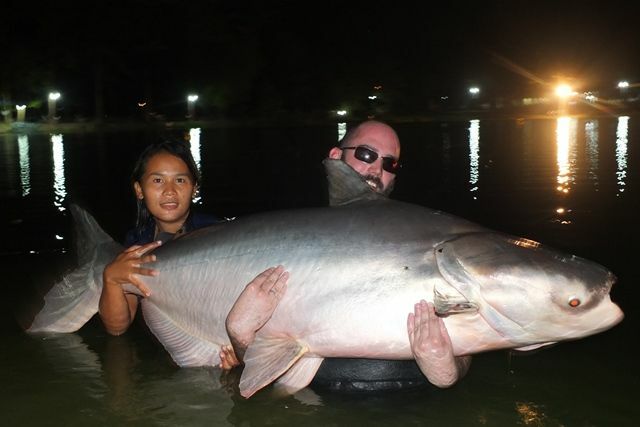 Tap of Bangkok Fishing Guide Service sent down his new guide Cloud with his customers for their first visit of the month and what a great job he did, catching a 165lb Siamese carp and earning his client a PTL 150lb Carp Club t-shirt in the process. 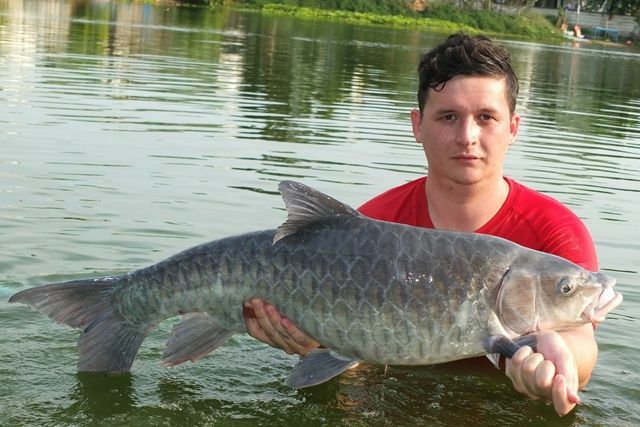 They also caught other Siamese carp, a superb black shark minnow, Mekong catfish, pirapatinga, striped catfish and Amazon redtail. 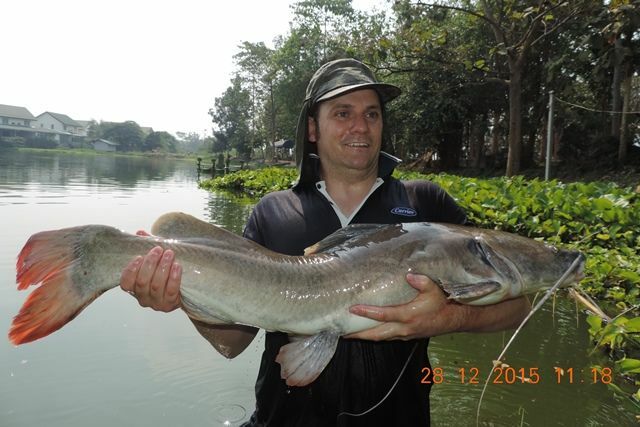 Thomas White also returned to the Mae Klong River for another chance to battle with the river monsters, no big ones this time unfortunately but he did catch a number of small and medium sized stingrays and some monster river prawns, plus some other strange river inhabitants. 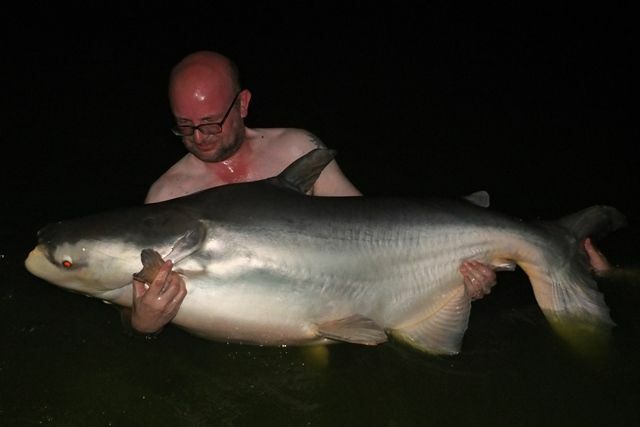 Deano Taylor made his inaugural trip to Palm Tree and had a great time catching the elusive wallago leeri as well as mekong catfish, and Amazon redtail. 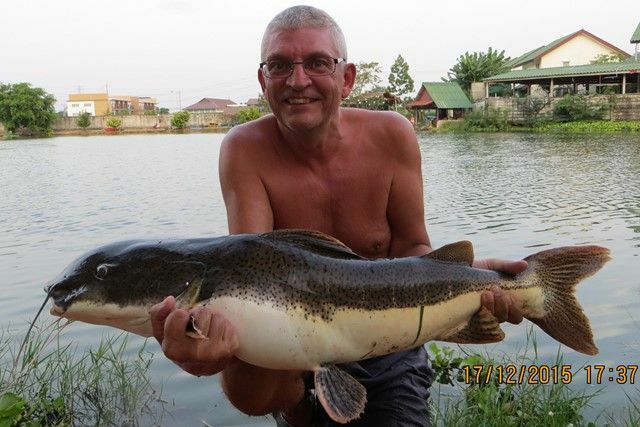 Martin Huuhka and his fishing buddies returned to the Mae Klong River after an unsuccessful trip last year. 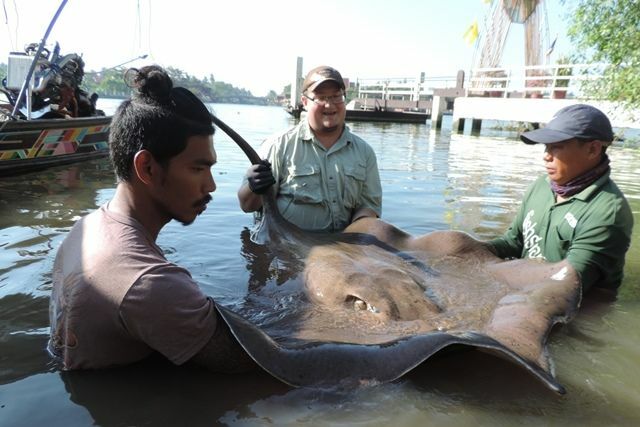 This time they did a lot better catching three stingray and a bull shark, they vowed to continue their quest next year for a bigger one. 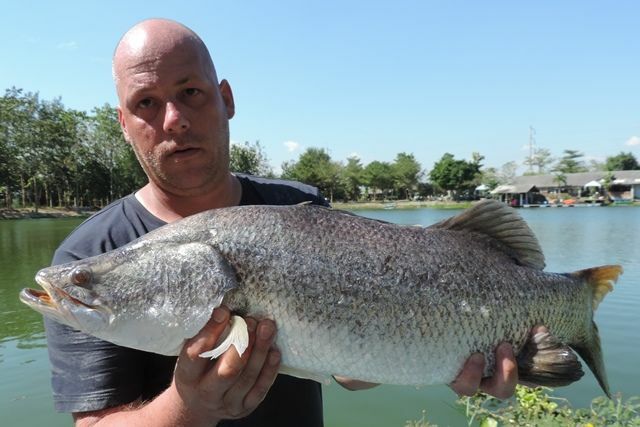 Tap of Bangkok Fishing Guide Service fourth trip of the month resulted in his customer catching a rarely caught barramundi as well as some great Mekong catfish, Siamese carp and Amazon redtail. 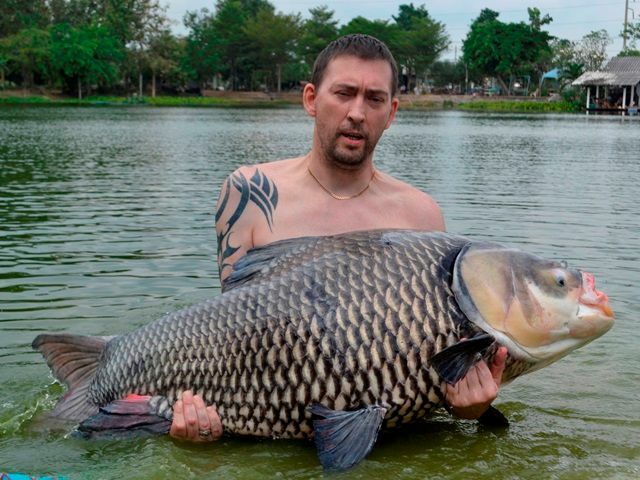 Jimmy Anderson was another angler who had a successful first session at Palm Tree catching numerous fish that included wallago attu, black shark minnow, arapaima, striped catfish, Mekong catfish, leopard catfish, Siamese carp, catfish shark and both Amazon and Thai redtails. 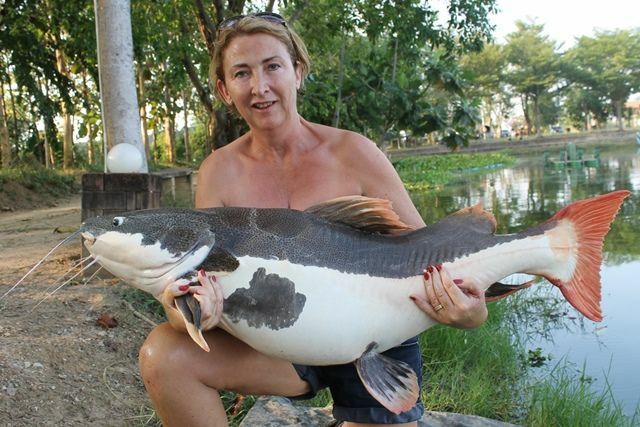 Jayne Harman was also into the fish during the month catching a multitude of great fish such as alligator gar, barred sorubim, arapaima, Chinese black carp, tambaqui, striped catfish, Mekong catfish, Siamese carp, rohu and Amazon redtail. 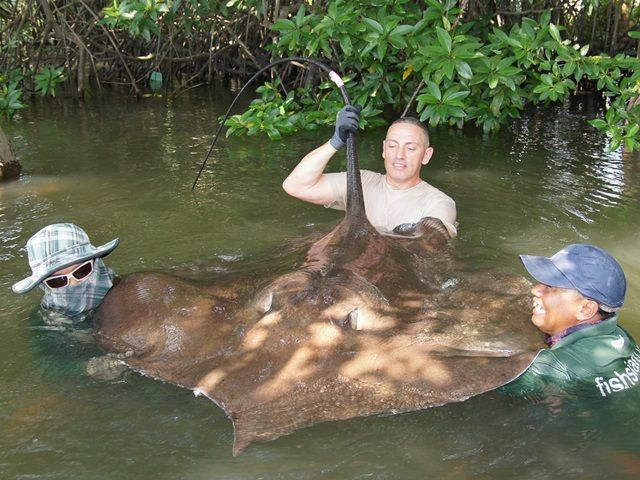 Nicolas Fruitieaux had a successful first visit to Palm Tree catching stingray, parapatinga, balck shark minnow, big-Y catfish, giant snakehead, Mekong catfish, arapaima, leopard catfish, alligator gar and Amazon redtail. Palm Tree regular Andrew Harman was back and as per usual caught a myriad of great fish that included arapiama, Mekong catfish, crystal eyed catfish, rohu, chao phraya catfish, big-Y catfish, tambaqui, Siamese carp, striped catfish as well as both Asian and Amazon redtails. 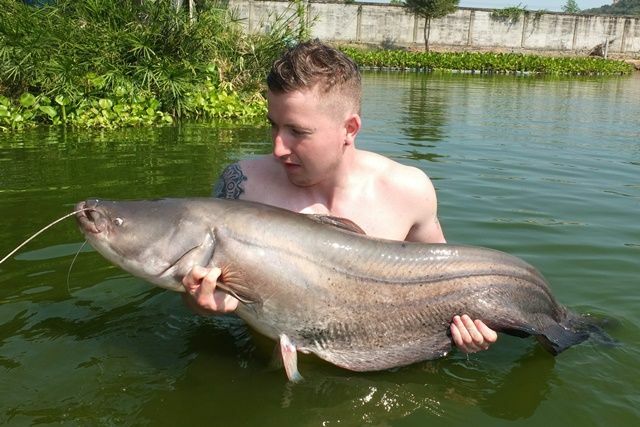 Stretton Honor popped in for his last day of his trip to Thailand catching a stunning catla carp as well as a big mollycot and black ear catfish. 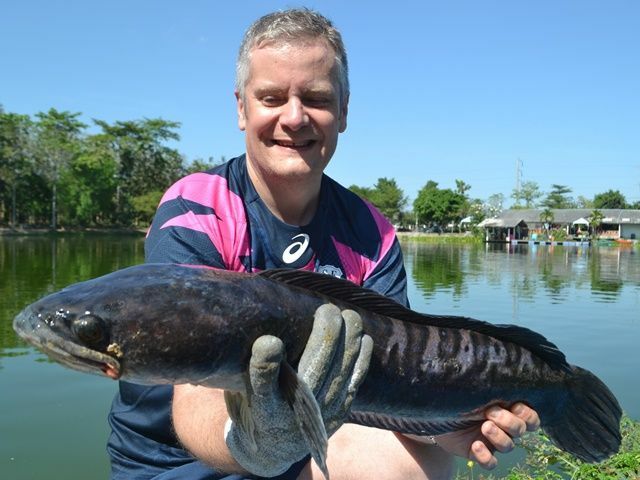 Barry Upperton also had his first session at Palm Tree during the month successfully catching leopard catfish, arapaima, Siamese carp, rohu, Amazon redtail and striped catfish. 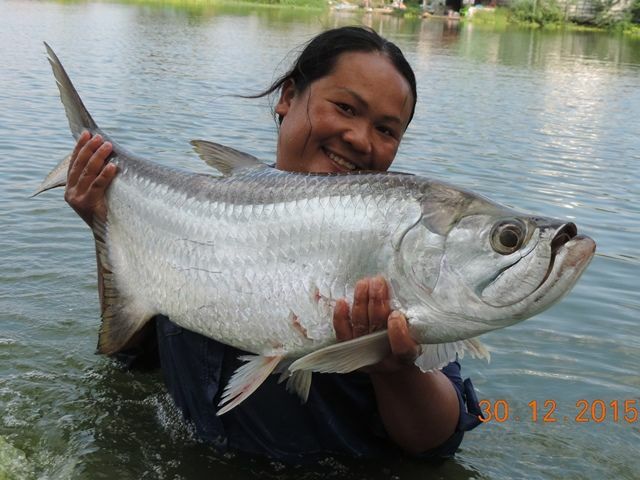 The guides were at is again during the month and as usual had some great catches that included Thai mahseer, tiger catfish, Siamese carp, Mekong catfish and Atlantic tarpon. 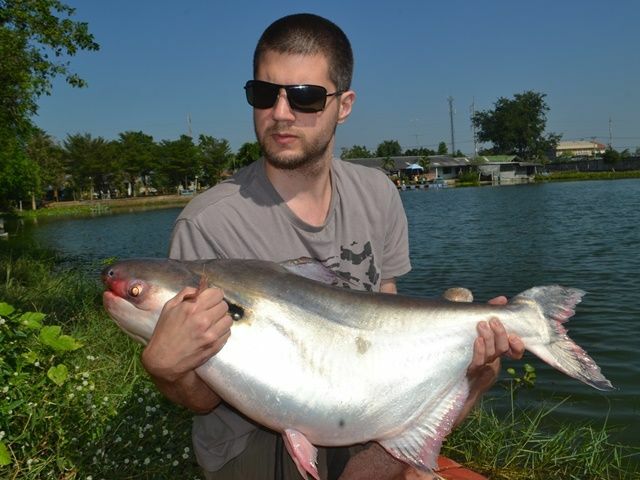 Daniel Smith another first timer caught Chinese black carp, Siamese carp, rohu and Thai redtailed catfish. Happy anglers David and Dan Johnson also enjoyed their visit to Palm Tree catching a number of nice fish that included alligator gar, Mekong catfish, catfish shark, striped catfish as well as both Asian and Amazon redtails. A trio Japanese anglers were all smiles with their results catching crystal eyed catfish, giant snakehead, Mekong catfish, Amazon redtail and rohu. Jim Lewes had his first session at Palm Tree during the month with two other anglers and between them caught some great catches that included a rare elephant ear gourami, Siamese carp, Mekong catfish, both Amazon and Thai redtail catfish, stingray, rohu and striped catfish. 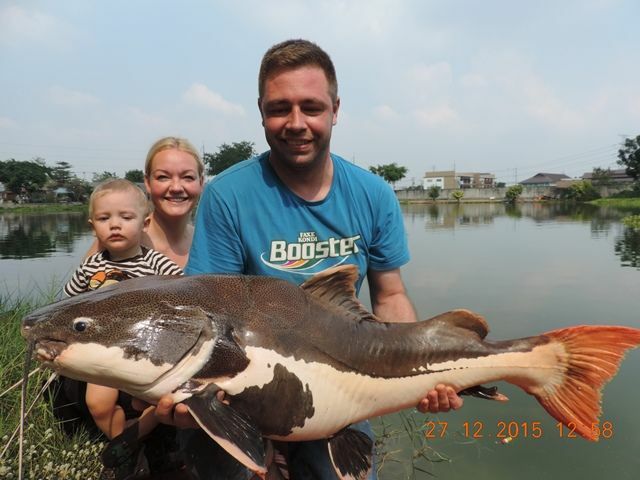 Tap of Bangkok Fishing Guide Service second trip of the month resulted in his customers catching some great fish that included a stunning Mekong catfish, wallag attu, striped catfish, rohu and Amazon redtail. An angler whose name eluded me dropped in as he passed by and caught a nice black ear catfish and a hard to catch Chinese bighead carp. 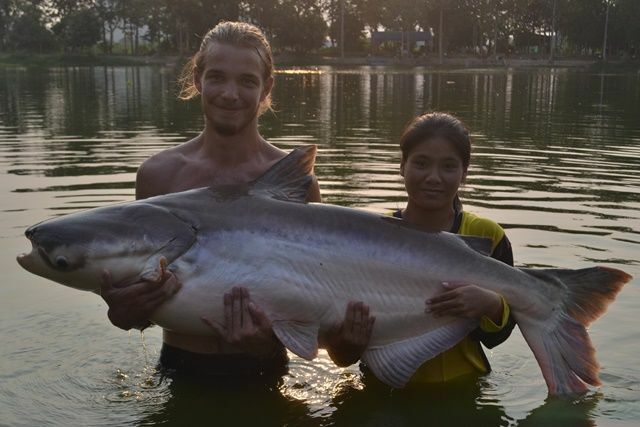 Karlson Anderson popped in with his family and landed Amazon and Mekong catfish. 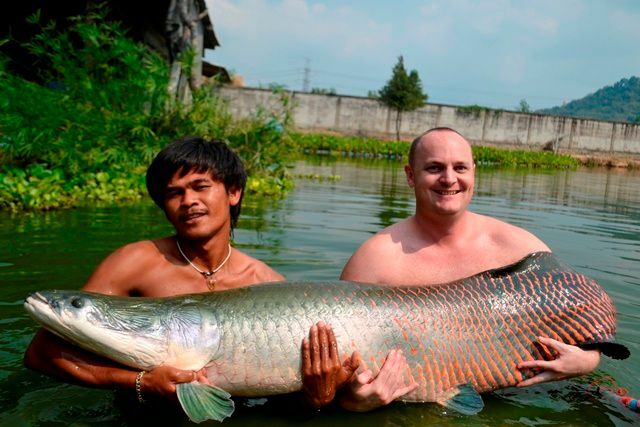 The two French lads passed by again and this time did a lot better than they did last month catching arapaima, and several mekong catfish. 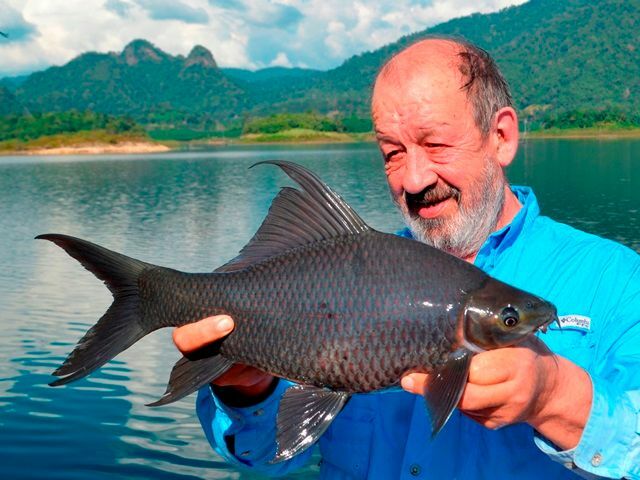 Graham Nuttall returned on his annual visit this time accompanied by his family and was well pleased with his arapaima and stingray. 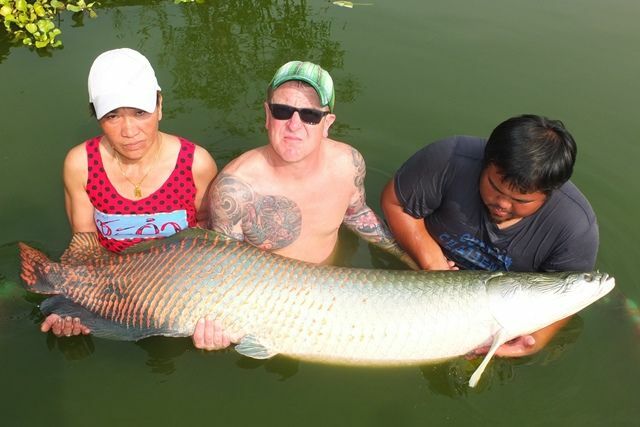 Martin Huuhka and two of his fishing buddies from Sweden were back and again caught some stunning fish that include wallago attu, soldier river barb, alligator gar, Amazon and Thai redtailed catfish as well as Mekong catfish. 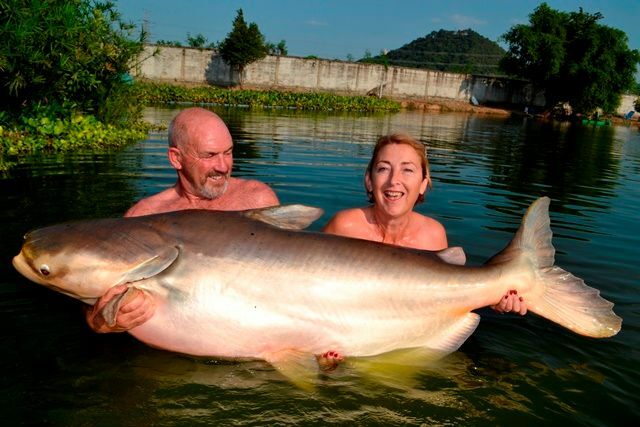 Eddie Brooke also returned during the month successfully landing Mekong catfish and tambaqui. Rick Moore returned and had a quiet day but did catch a nice Thai redtail and some striped catfish. Another angler dropped in on his way past and successfully caught some Mekong catfish, rohu, alligator gar and Amazon redtail. 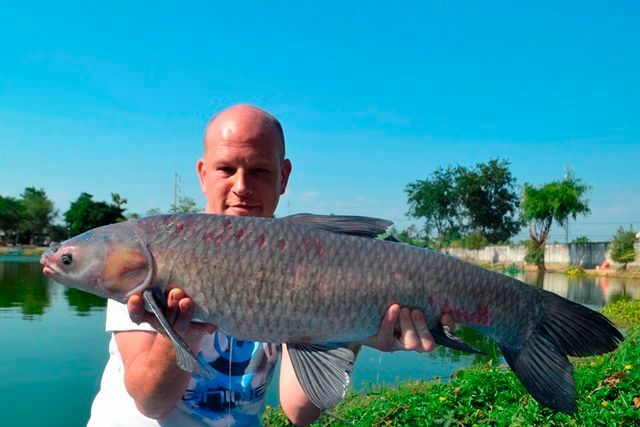 A returning Russian angler made his annual pilgrimage down to Palm Tree and managed to catch a nice Mekong on what was a slow session. 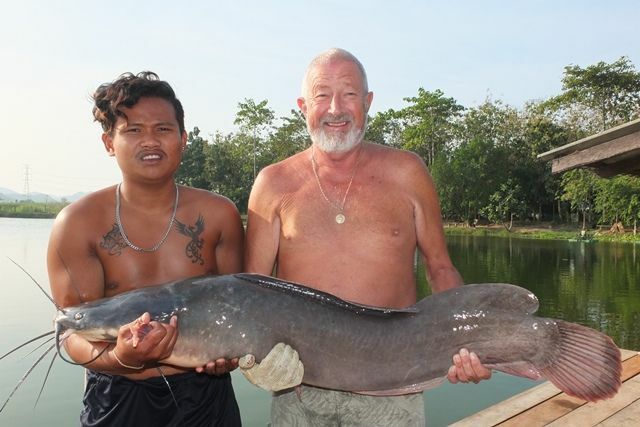 Nils de Kalbermatt made his way down from Pattaya for his first visit catching chao phraya catfish, wallago attu and a good sized mollycot catfish. 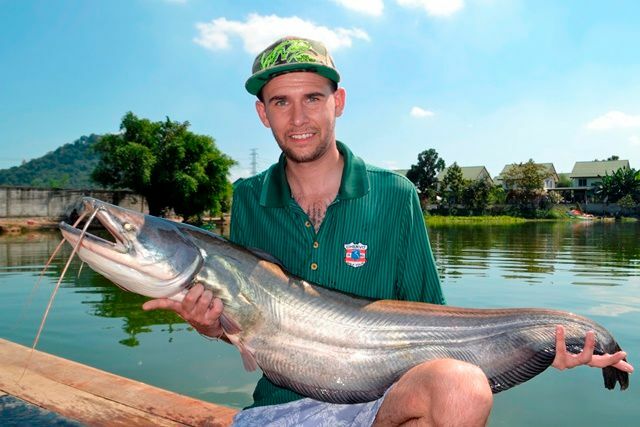 Tap of Bangkok Fishing Guide Service was down for his third trip of the month with his customer catching a large alligator gar that he was to apprehensive to pick up and a good sized Mekong catfish. 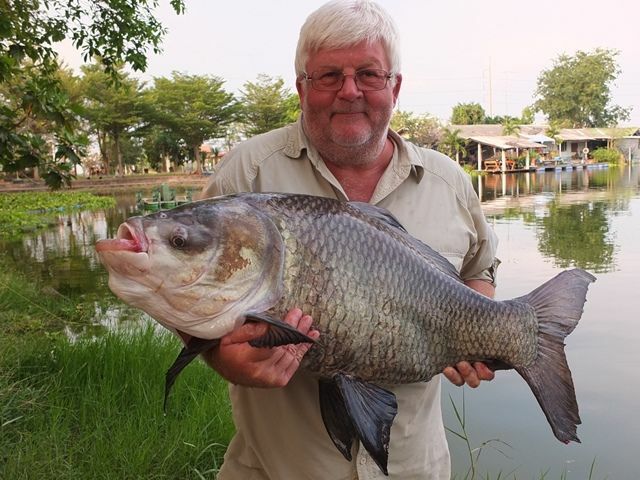 Return customer Ron Long caught his first ever Chinese black carp as well as some nice mekong catfish and striped catfish. 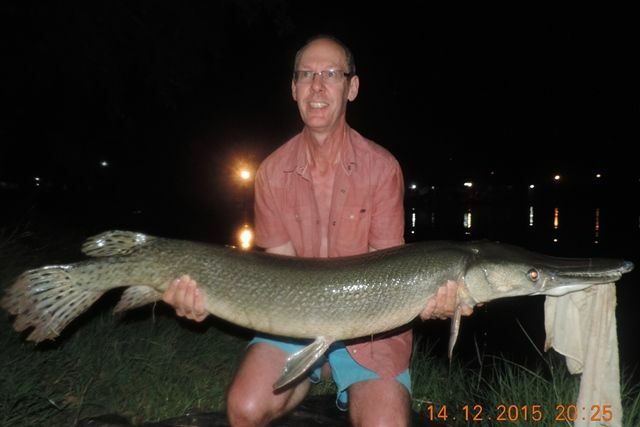 Tim Hindson also passed through Palm Tree for his first visit catching an arapaima and some striped catfish.